Steven (Chicagoland, United States) on 15 February 2018 in Landscape & Rural and Portfolio. 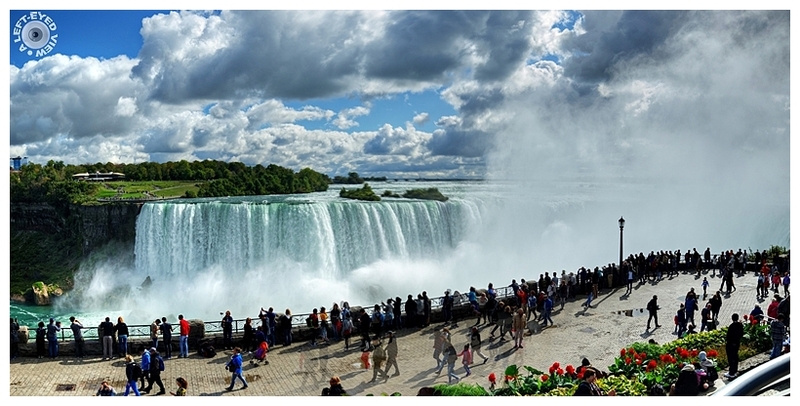 A two-shot panoramic photo of Horseshoe Falls, as seen from Canada, captured September 30, 2017. Un endroit fantastique, mais que de monde ! Beautiful scenery. I like the wat youcompose it and contrastibg of the heaven. Fantastique chute et vue quelle évaporation quelle vue et ces personnages superbe. I love the billowing mist which I remember begins to soak you while you are relatively far from the falls. A great image. . . wow . . that's what I call 'impact' ! Wow, magnificent view indeed !! It's apparent why so many people are standing here enjoying the fabulous view. A very successful picture. Just great! Crystal clear detail and a perfect sense of scale. You've hit several photo homers with your falls series. A beautiful panorama of the falls and the people. Excellent! Spectacular! Will you be able to see a rainbow if you wait till sunset? My favorite part is the idea of people's movement, created to overlay the photos. A gorgeous image! It reminds me when I visited there. During the summer and lots of visitors. It certainly does give it a very lively feeling! That is a really nice composition with all those people in the foreground. Another gorgeous shot from Niagra! Wait. I think I see ghosts??!! Well done, Steven. Really impressive to see ! Great view and great panorama. This reminded me that I took quite a number of pictures when I was there many years ago. At that time I was shooting only Kodachrome slides, I will have to look for them and digitize them. A great photo : bravo.